I don't do a lot of wine cocktails. Most of the time I prefer to enjoy my wine as the vintner intended, but I do occasionally enjoy a sangria or a wine cooler. When I came across this interesting bottle of Chocolate Shop Red Wine I impulsively grabbed it off the shelf. I'd enjoyed Deco Chocolate Port when I lived in Sonoma County and thought I'd give this wine a try. I loved it! It was similar to the port, was a little less chocolate forward, less sweet with a lighter body. It's exactly the kind of dessert wine I would serve with chocolate strawberries or chocolate truffles or anything with chocolate. I might even pair it with a savory dish like cocoa and coffee rubbed rib eyes. Of course being me, I had to add stuff to it to make a cocktail. 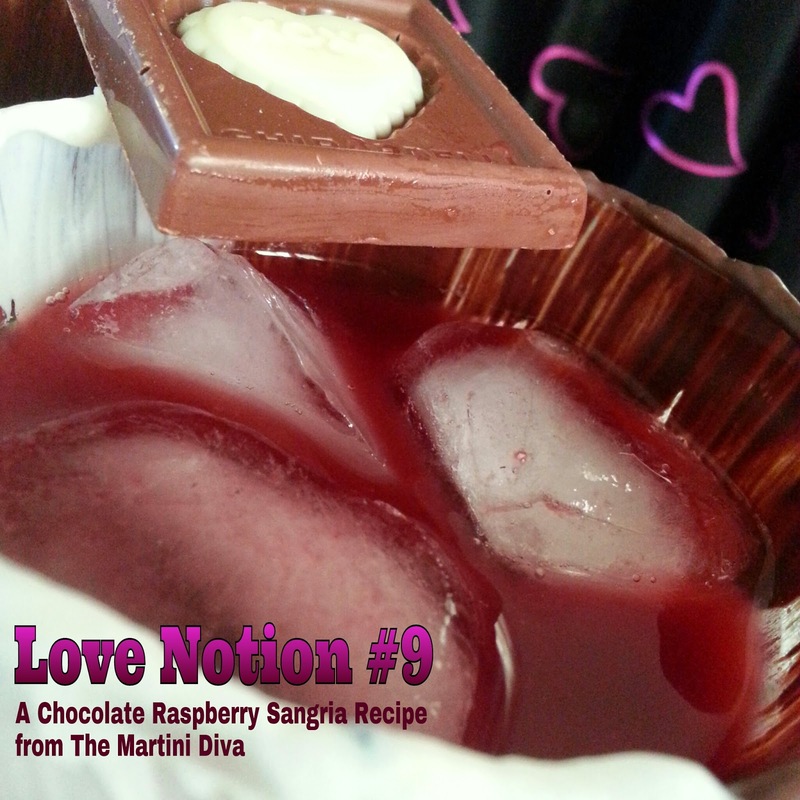 What I ended up with was a remarkable chocolate raspberry sangria. I think I've died and gone to heaven. Special Tools: Pastry brush, Old Fashioned glass, metal strainer. DIRECTIONS: Melt the white chocolate in a double boiler or microwave then paint the rims of your glasses from the top to a quarter of the way down the glass. Attach a chocolate heart candy to each rim with an extra dab of chocolate, holding gently in place until it stays. Place your glass in the refrigerator to set up the chocolate. Puree the raspberries with the Chocolate Shop Red Wine, raspberry vodka, chocolate and raspberry syrups and bitters in a blender. 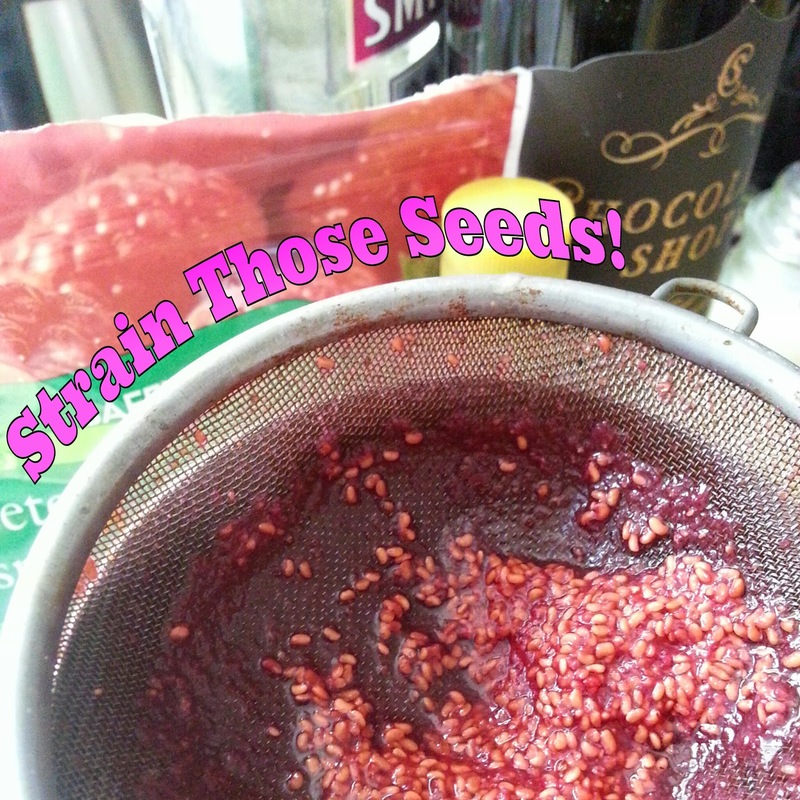 Strain this into an ice filled cocktail shaker (to remove the raspberry seeds) and shake until chilled. 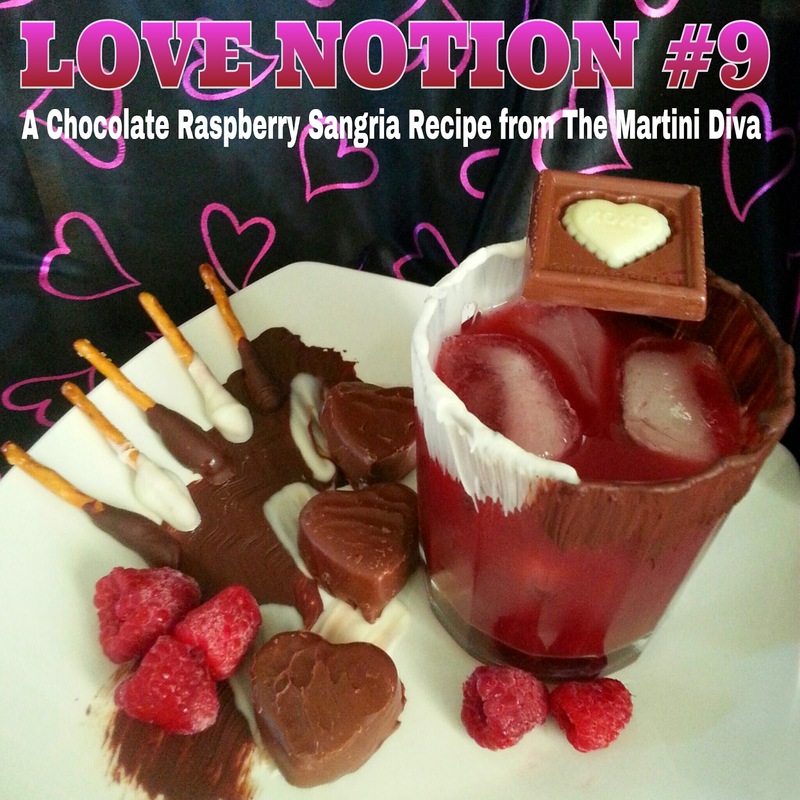 Pour into your garnished glass and enjoy for a romantic finish to your Valentine dinner. Makes two full cocktails. Some chocolate dipped cookies, chocolate covered marshmallows, sugar, chocolate dipped pretzels or nuts go really nice with this cocktail. 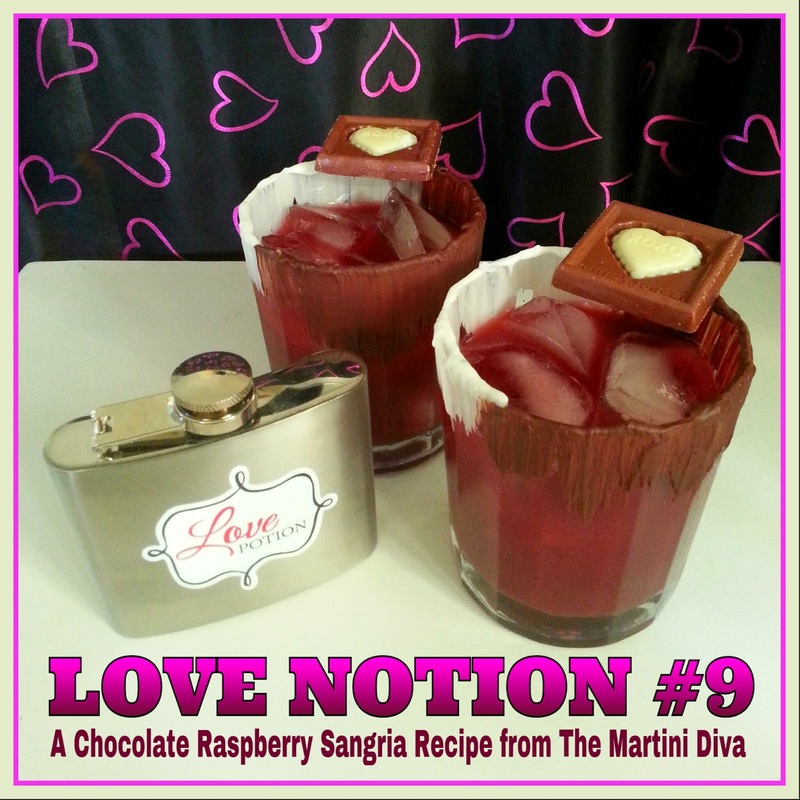 Tip1: Use up the rest of the melted chocolate by dipping the pretzels or nuts in it to serve with your cocktail. Tip 2: Reduce any of the sangria leftovers to a syrup and pour over ice cream! If you have any, that is, and you probably won't.